Apocalypse? Just where is our image of the week from? This week’s image of the week is from a major event that took place over 100 years ago. It was early in the morning. Most people were sleeping. And then it happened. In 1906, San Francisco was the center of the west coast of America. It was the largest city on the coast and a major port. But then the earthquake hit. 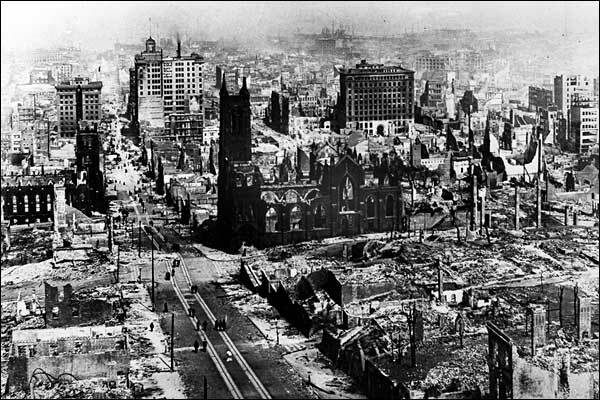 The 1906 San Francisco earthquake happened on April 18, 1906. The city arose to a rumbling shortly after 5AM in the morning. And that rumbling produced terrible devastation. It is said that over three-quarters of the city was destroyed and the total number of dead is estimated at 3,000 or more. And the survivors had a hard time. Hundreds of thousands were left homeless. Our image shows a scene of destruction after the earthquake. We can see that many parts of the city were flattened, while those buildings that remained were shells of their former selves. The most prominent building in the picture is a ruined church, while skyscrapers haunt the background. Of course, happily the city later recovered. What else do we have for you? Well, here are a few images you may not expect from the American move west.